Through some messages with the admin (seen below), I have received some truly terrible news. The Admin was responding via the sister site Trade Cards Online (TCO), and these pictures come from my messages section there. So. Things are in BIG trouble. I'd say this is probably the worst news the Pirates CSG community has gotten since the "cards-only" flop version was announced in 2011 or whenever. It has certainly put a damper on my week. Any non-confidential information I receive will be shared in this thread and posted as it comes available to me. I want to keep everyone informed about any and all information that we can use. HOWEVER, this is just the beginning. Three months gives us plenty of time to recover and save tons of information from the site, even if there is no coming back. In addition, I have already sent a message to Cardmarket, which you can see below. I actually have an account at CardMarket (guess I'll abbreviate CM for now - not cargo master haha) from earlier this year because I made about 5 euros from two people buying premium on MT through my affiliate link. I didn't know it until this year, but CM apparently acts as the way MT (and TCO I would imagine) distributes these payments (prior to this year I just had Friendship Points from referrals, never premium commissions). It is time to reach out to CardMarket and let them know how badly we need to see Miniature Trading survive!!!!!! From the above picture you can see their basic contact email address. They say their contact form is the best way to contact them. I sent the same message through that before copying and pasting it into an email message as well. Unfortunately you seem to need an account to use the contact form, so email would be easier. Do both if possible. Feel free to post here if you've contacted them, with your message if you want/etc. And any information you receive back from them should obviously be posted here. After receiving the bad news in that message on August 20th, I began what could become a long project of archiving and saving stuff from Miniature Trading. I know the Wayback Machine could be great for this, but between photobucket, postimages, and now Miniature Trading (and other past Pirates sites), I don't really trust any of these online entities. So I'd rather keep stuff myself and rely on nothing but my own devices and "the cloud". I have already begun transferring some of my longer and more useful/informative posts (Huge Game Legacy, Beginner's Guide, etc) to Pirates with Ben to be posted as pages or posts in the future. Beyond saving things as text files and copying and pasting text from the forums and whatnot, we can take PICTURES! You can search your computer for a preinstalled Snipping Tool, which I have used a lot (including the messages above). I just started using this a few days ago, and it is FANTASTIC. It also carries a 5/5 star rating from nearly 20,000 reviews. It works pretty quickly and grabs the entire page by scrolling your browser window. Once I finish posting this, I plan to take captures of ALL the sets in the database. Saving each individual picture would take a LONG time, but perhaps there's some way to save the gallery pictures separately more easily than that. Here is a list of things to think about for your personal contributions. Once you're satisfied with saving whatever you want from your own profile/etc, feel free to save what you want from the forum/old fleets/etc. Please post here what you have saved/archived, and possibly provide a link to a public photo gallery or something if you'd like. Given the 3 month time span (hopefully the plug won't be pulled sooner....), we could pretty much archive the entire site if we wanted to and recreate it somewhere else with the files/pictures/info. Not that we need to save every thread (not nearly), but there is certainly a core chunk of Miniature Trading that would be truly awful to lose. What else can we do? I've re-enabled ads on MT by disabling my adblocker for all of Miniature Trading's pages. The potential tiny ad revenue is not likely to help, but obviously there is some desperation in the situation. Given this disastrous news, I would hold off on any Miniature Trading related projects for now, and save any future thread ideas/etc into a document stored elsewhere. -If you have any other ideas/etc on the situation and how best to handle it, please post your thoughts here. Weirdly enough, postimages was not working when I tried to submit this post, so I had to use imgur to host the pictures instead. Ugh. I love this whole internet thing, but it's rather impermanent for my tastes. I don't know the full details of the situation, but this feels eerily similar to the Wizkids shutdown and subsequent (and in hindsight, undesired) takeover by NECA. CardMarket is apparently going to take over and shut down our beloved Miniature Trading site! The good news or silver lining this time, unlike back in 2008: WE HAVE A WARNING. Let's make the most of it! There is so much to do. So much to save. So many messages to be sent. Let's do it!! Example of a full page screenshot using the extension linked above - no need to scroll yourself and take multiple snips at different scrolling levels - it takes it all. If you have any Friendship Points, now's a good time to cash them in for Premium Membership. Go to your Profile and look for the "1 Month for 250 Friendship Points" button near the top. I had enough piled up for 7 months. The rest of the Rules thread is too big and unwieldy to bother saving, especially since the images won't be searchable. I'll work on getting the no-duplicates list reposted over on BGG sometime in the near future. By the way, that utility for grabbing a screenshot of an entire page is awesome - thanks for recommendation! @Woelf: THANK YOU! Indeed, the full page screen capture is great. I just got home and will continue to update on my progress with various things. This is so depressing. And confusing. I don't understand why a European based company would buy these just to shut them down. Its not like they are even competing in the same market. Since school is starting, I doubt I will be much help right now in saving stuff. I am going to back up what little I need of my personal stuff now, and then if needed in a few weeks I can help with other stuff. If you can't convince the new company to keep it up, and you indeed wish to expand your own personal website, I am sure a kickstarter etc for hosting the extra stuff would be something that the community would support. I just hope this new company agrees to keep it in it's current form. Maybe they see some value in the card/mini/etc. databases of the two sites (although more likely just the TCO portion, with MT along for the ride). If Card Market is planning to create their own similar site, having that data already set up maybe saves them enough time and/or money to justify buying it instead of recreating it on their own. Maybe they see TCO/MT as potential competition, even if it's indirect. Maybe they just want the database of users. Maybe it's something else less obvious, but there's clearly something there to justify acquiring the site, rather than just ignoring it. If the admin just wanted out, he could have let it die quietly without CardMarket getting involved. Ben - Do you want me to email the screen grabs to you so everything can be kept in one place? Thanks for your efforts to save the site and make others aware of the upcoming events. 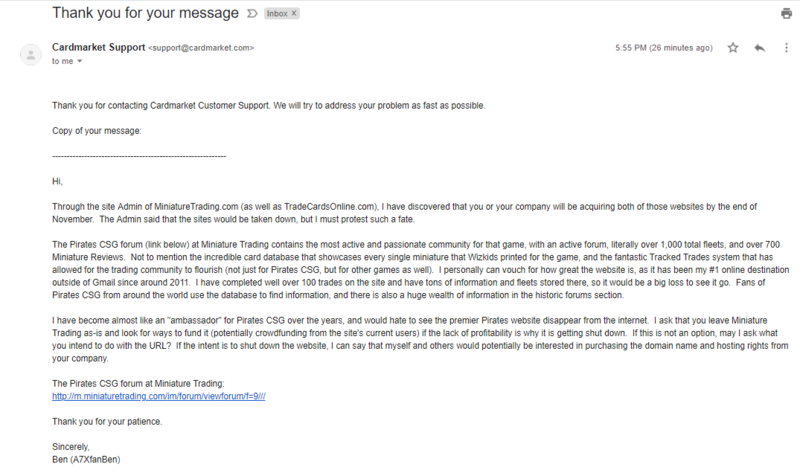 I've also written the CardMarket staff an email about the acquisition; hopefully others here do the same. If you want, sure! postimages acting up recently has only added to the confusion on my end, but I can certainly keep things on my computer and upload them to imgur and elsewhere for backups and additional safety. No obligation from anyone, but if you want to send anything to me, my email is simply my username (a7xfanben) @gmail.com. @gamer_2k4: Thanks for emailing them! Might start doing a daily post of my progress on stuff. Going to be raw and random, partly just as a way for me to keep track of what I've done and tasks/etc for the next day+. Started running httrack from recommendation at subreddit. Entered homepage url of MT for site to “mirror”, will leave computer on and let it run. -Made a primitive/starter forum at PwB, tested functions of logging in/out and posting successfully via a second account. Much work to be done with it, but basics seem to work. "23:00:30 Panic: Too many URLs, giving up..(>100000)"
Overwhelmed, but making progress! Hoping to make progress on various stuff every day. Working on pertinent stuff on page 13 of the forum, not including the things already archived. I'll keep updating this post. Working on pertinent stuff on page 13 of the forum, not including the things already archived.